Even during a big snowstorm or an extremely frigid night, I must say: I’m not a huge fan of hot toddies. Unless I’m super-sick, which, thank goodness, somehow, I’ve been able to avoid so far this season. 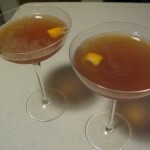 No, when it comes to winter cocktails I am a huge fan of two things: cognac and citrus. Sometimes together; sometimes not. And if not cognac, then some other brown liquor, certainly. Any of the following will warm you up nicely this weekend. Bonus points if you get to sip them in front of a fire. Cocktail recipes for a snowstorm, after the jump. 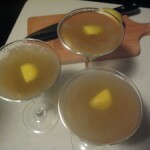 All recipes make two cocktails with a handsome dividend for each drinker. Click on the names to skip down the page to that drink. Cheers! Set ice and water in cocktail glasses to chill them. Combine ingredients in a small pitcher and stir. Pour some into a cocktail shaker filled with ice. Empty the water from the glasses. Shake vigorously and strain into the glasses. Garnish with a lemon twist. You may also rim the glass with sugar, but we don’t usually bother. 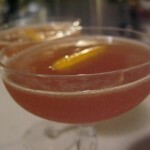 First served by Joseph Santini of the New Orleans Exchange Bar, according to the PDT cocktail book. 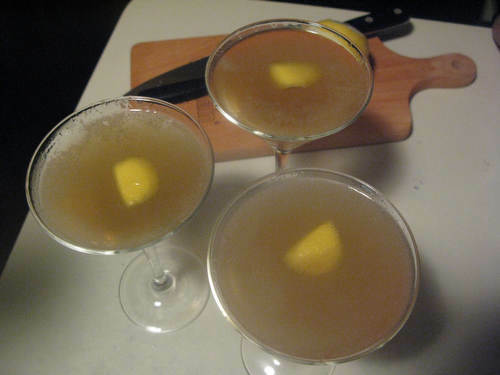 A play on the Sidecar, but made with apple brandy. 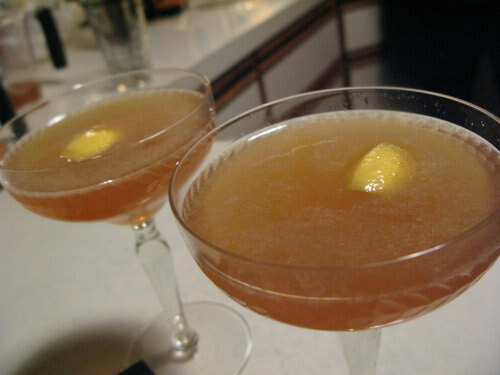 I discovered this forgotten classic cocktail in one of my favorite bar books, “Cocktail: The Drinks Bible for the 21st Century.” The authors say there are two ways to make Satan’s Whiskers, straight or curled. 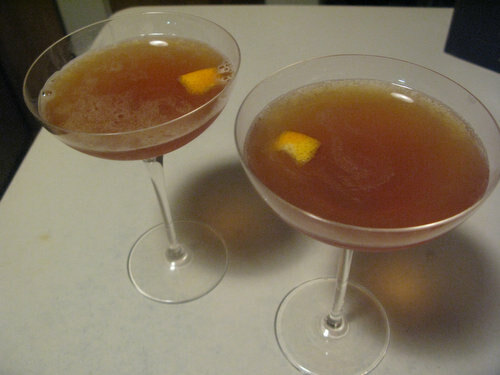 The “straight” Whiskers uses Grand Marnier; the “curled” Whiskers uses Cointreau. I take mine straight. And straight up. Shake with cracked ice; strain into a chilled cocktail glass. Remove four long strips (twists) of rind from the grapefruit, being careful not to remove very much of the white pith. Cut the grapefruit in half and squeeze the juice from each half. You should have about 8 ounces. Reserve one rind. Pour the salt onto a small plate. Cut the reserved grapefruit rind in half, then rub the juicy side of the fruit along the outer edge of the lip of each glass… not along the inside of the rim. Holding each glass at an angle, roll the outer edge of the rim in the salt until it is fully coated. 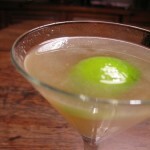 Fill a cocktail shaker with ice and add the vodka, vermouth, Cointreau and grapefruit juice. Shake vigorously until the outside of the shaker is thoroughly beaded with sweat and is extremely cold to the touch. 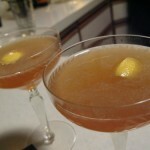 Adapted from David Wondrich, cocktail historian and writer extraordinaire. 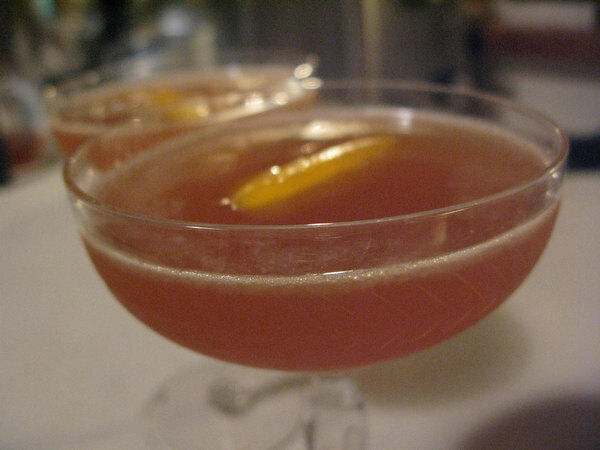 According to Esquire, for which Wondrich is a cocktail correspondent (how do you like that title? ), the drink was originally created for The Chickenbone Cafe in Williamsburg, but revived for a Halloween article, mostly because of its name. I think it’s tasty any time of year. This article was originally published on Feb. 8, 2013. 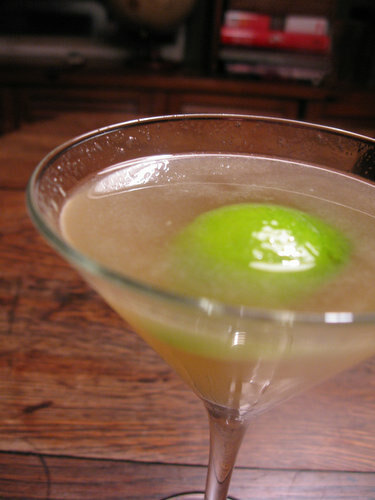 The Carjack definitely looks tasty with the Apple Brandy. Nice recipes here!